Posted on 14, July 2016 by EuropaWire PR Editors | This entry was posted in Education, Electronics & Machinery, Netherlands, Technology, Transportation & Logistics, Travel and tagged Eindhoven University of Technology, Electric touring motorcycles, STORM Eindhoven team. Bookmark the permalink. 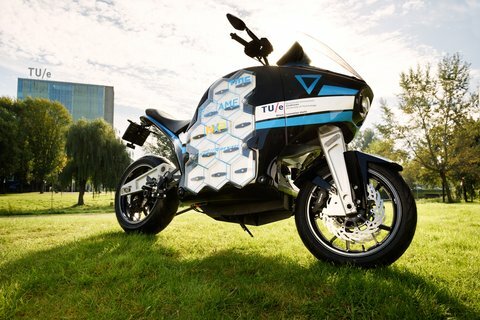 The STORM Eindhoven student team from Eindhoven University of Technology (TU/e) will present their two final self-developed electric touring motorcycles on Thursday 14 July at the High Tech Campus Eindhoven. Following the presentation they will set off in August on an 80-day round-the-world ride to demonstrate the potential of electric transport. EINDHOVEN, 14-Jul-2016 — /EuropaWire/ — The STORM Eindhoven team members have been working since 2014 on designing and building their long-distance electric motorcycles, with the mission of strengthening the worldwide image of sustainable transport. Their electric touring motorcycles perfectly present what they believe electric transport should be: silent, efficient and with a sufficiently long range. Now that the second electric touring motorcycle is ready, the countdown can start to the ‘Around the World in 80 Days’ ride – the STORM World Tour. The team will set off on 14 August 2016 from Eindhoven. Their journey will take them round the northern hemisphere: through Europe, Asia and North America, covering roads totaling 26,000 kilometers. According to STORM Eindhoven, the most important factor in convincing the world audience is sharing the experience. People, universities and industry from all round the world can be part of the ‘STORM Grid’ and offer access to electricity supplies or other facilities. A special feature of the electric touring motorcycles is the modular battery pack developed by the student team themselves. This consists of 24 separate cartridges with a maximum power capacity of 28.5 kWh, giving the motorcycles a range of 380 kilometers before recharging is needed. The number of cartridges can also be adjusted, allowing a lighter weight and higher speeds to be achieved. The unveiling will take place 14 July at the Conference Center at the High Tech Campus Eindhoven. At 12.00 hours the team will start with a short presentation before they unveil and demonstrate the motorcycles. This will be followed by the opportunity to talk to the team members and to see the motorcycles in action. STORM, world’s first electric touring motorcycle, designed by students of TU Eindhoven.